the Trades Unions have called a strike! Capitalists miss two turns at the dice. Among the various ground-breaking concepts mooted in the latest nerve-tingling installment of Freaky Trigger and the Lollards of Pop was the suggestion that there might have been a ‘Bolshevik Monopoly’, so households of a socialist persuasion didn’t have to miss out on that all-important board-game family bonding time. 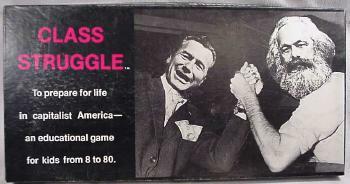 Naturally my ears pricked up, for I in fact have seen this game: we have it at my parents’ house. Oh, perhaps it’s not quite ‘Bolshevik Monopoly’ (as, naturally, in a people’s communist paradise the state holds all monopolies), but it’s fairly close – Bertell Ollman’s Class Struggle, “an educational game for kids from 8 to 80… to prepare for life in Capitalist America”. It is a game for two to six players, who play not as individuals but as social classes: the Workers, the Capitalists, the Farmers, the Small Businessmen, the Professionals, and the Students. Only the Workers and the Capitalists can win Class Struggle, and naturally the Struggle itself is biased toward the Capitalists, being as they are the ruling class of the modern era. If you represent one of those other, minor social strata, your only hope is to enter into an alliance with one the warring two, and use the assets of your class to support your comrades in any future Class Confrontation. As in any other board game, you follow the throws of a die around the board, picking up assets and debits and chance cards as you go along. There are a set of beginners’ rules, for players new to the Struggle; a more complex set of full rules, for those grown familiar with the complexities of class warfare; and an explanatory booklet that converts such tabletop lessons to street-level reality. It is clearly the most exciting, insightful, revolutionary board game ever designed; and yet, for some reason, we have never played it. Perhaps it is just too depressingly true to the crushing reality of modern society’s iniquities and inequities? Perhaps we’ve been too worried that overexcited play might damage the wood-and-cardboard pieces and the flimsy chance cards? Perhaps it is actually quite dull to play? Perhaps – perhaps, sometime soon, a group of like-minded comrades should join forces, should stand together, and sit down together around the table, and see how long it takes before someone accuses someone else of being a capitalist running-dog. who is the fella in the pictue who is NOT uncle karl? According to this, it’s Mr Rockefeller himself. Hurrah! However on FTBGSD can we please not play Diplomacy. We played it at college once and it caused many arguments because you cannot win by following historical precedent. However throughout the game we did all wear AMAZING hats denoting our pre-WW1 empires: I was Great Britain so I had a queenly tiara, someone had a fez for Ottoman, Napoleon bicorn-type thing for la France, spiky helmet for the Bosch, one of them woolly hats for Russia etc. I have a game called Stalinallee, in which you try to rent an apartment on Stalinallee in 1950s Berlin. Unfortunately, the rules are all in foreign so I cannot tell you amusing anecdotes about it. My guess in the ‘capitalist running dog’ accusation sweepstakes: 0 seconds. FTBGSD should be provisionally pencilled in as part of good friday poptimisim all-dayer, sa i! Dude, there is no way I am going to be up for dancing after a punishing eight hour game of civ. Dude, have you never played the Dip variant DOWNFALL? The strange thing about this game is that you choose at the beginning of it whether you’re a capitalist or a communist, and the way you win depends on which you’ve chosen. Capitalists just try to collect as many credits as possible (while avoiding debits) and communists… see now I can’t remember. This is why communism failed. I would be definitely up for this! i'm sick of standing by the dj booth pretending that i'm cool.